I’ve been home from Makalu almost two weeks now and it’s been almost three weeks since I last posted — time flies. I was able to leave base camp very quickly because Cory Richards injured his knee in the deep snow just a few hours from base camp, the day after my last call. He necessitated a helicopter evacuation from base camp and I was able to hitch a ride out. Two and a half hours of flying at 120 knots sure beats walking eight days when you’re just ready to go home! Editor’s note: Steve House puts the finishing touches on his Makalu 2009 series today with a bunch of photos from the trip. You’ll find links to the rest of the series — most of which include sat-phone calls from Makalu — at the bottom of this post. Once in Kathmandu I was able to change my ticket for the very next day. 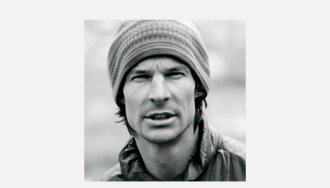 Unfortunately, almost as soon as I landed, I was hit with news of the loss of Patagonia Ambassador Jonny Copp, Mountain Hardware athlete Micah Dash, and young filmmaker Wade Johnson on China’s Mount Edgar. While tragic, it certainly made it difficult for me to feel any self-pity for my own problems. Deadlines, work, trying to get some climbing in; I am happy to be alive and healthy and home. Our thanks go out to Steve for sharing these photos and taking the time to call on his sat phone. Should another attempt at the west face be in his future, we hope the weather cooperates.